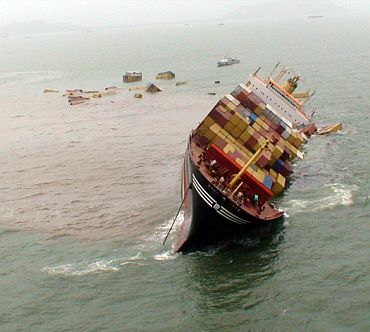 A foreign cargo ship, which collided with another vessel about 10 km off Mumbai harbour, tilted further spilling oil for the third day as Navy and Coast Guard made hectic efforts to contain the leak. "MSC Chitra has tilted 80 degrees and the total oil spill is nearly 50 tons, Arun Singh, Commandant (Operations), Coast Guard told PTI. He said so far, 300 containers carrying oil have tumbled into the water. Maharashtra Chief Minister Ashok Chavan undertook an aerial survey of the oil spill on Monday. A worried Chief Minister Ashok Chavan said, "This is a serious issue. The Coast Guard and the defence people are looking into it. We have already filed cases against the captains of the two ships which are from abroad." "I would say the state and the Union government is doing its best. Definitely it is a matter of concern and we have advised the people in that area not to go in for fishing because fishes and the marine life in that area is bound to be affected by this oil slick. We are trying to contain it as far as possible," he added. 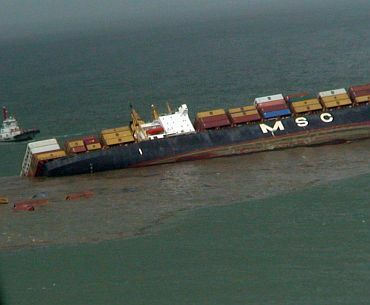 Two Panamanian cargo ships -- MSC Chitra and MV Khalijia-111 -- collided on Saturday off the Mumbai coast causing an oil spill from one of the vessels. Thirty-three crew members, including two Pakistanis, were rescued following the incident. The Navy and the Coast Guards carried out anti-pollution operations for the third consecutive day on Monday to check and neutralise the oil spill. Six Coast Guard vessels and a helicopter with anti-pollution dispersal spray systems were pressed into service on Sunday to contain the oil spill. The Bombay Natural History Society has found fresh on-shore oil spill along the Mumbai-Raigad coast, besides tar balls in some places. "We have found good quantity of fresh oil up to six inches in depth along the beaches in Sasvane, Kihim, Revas and Mandava and Alibag along the Mumbai-Raigad coast," senior scientist at BNHS Deepak Apte said. "We are taking samples for analysis. This may be only a beginning of finding the on-shore oil spill as we are already on the job to locate it," Apte said. The Indian Coast Guard had approached the BNHS on Sunday to do an oil spill survey and locate on-shore oil spills in the region and how far it has spread. Apte, who is leading a team of scientists carrying out the survey, said fresh tar balls were found at a couple of locations although locals claim that tar balls from oil rigs and refineries are found scattered on beaches during monsoons. More than five batches of scientists from BNHS are on the job along Chowpatty, Gorai and Malad beaches besides backwaters along Sewri and Uran, he said. "We will be reaching Revdhanda shortly," he added. Officials, meanwhile, are yet to locate the leakage. The thick oil slick has been sighted two to three km around the vessel Chitra. 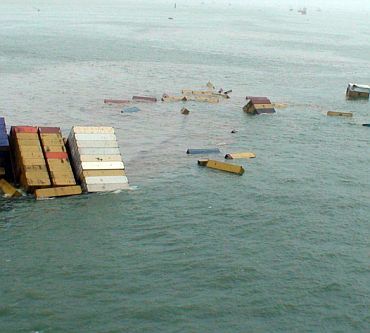 According to officials, Chitra was carrying about 1,200 containers, which had over 266 tons of fuel. Deputy police commissioner Khaled Qaiser said that an FIR has been registered against captains and crew members of both the cargo ships under relevant sections of the Indian Penal Code and the Environment Protection Act at the Yellow Gate police station. The crew members were booked under Sections 280 (Rash navigation of vessel), 336 (endangering life of others) and 427 (mischief causing damage) of IPC and relevant sections of Environment Protection Act, he said. So far nobody has been arrested, the DCP said, adding that all crewmembers will soon be summoned to the police station for questioning. 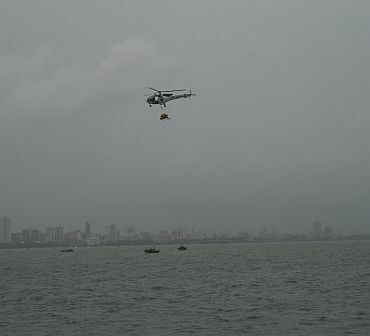 Additional Coast Guard Pollution Response Equipment has also been mobilised from Goa and assistance is also being taken from ONGC, JNPT and other agencies. The state administration, the Pollution Control Board, the Maharashtra Maritime Board and the BHNS have been kept on high alert for mobilisation of response resources for shore clean up. 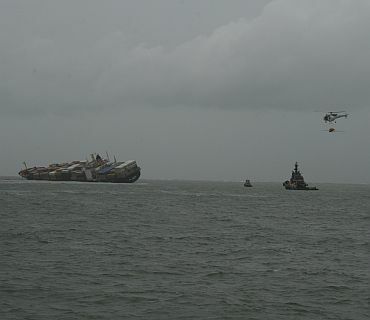 MSC Chitra, the outbound merchant vessel from Jawaharlal Nehru Port Trust, collided with MV Khalijia-III at 9.50 am on Saturday when the latter was sailing towards the Mumbai Port Trust, off Mumbai harbour, for berthing. The Indian captain and 32 crewmembers of Chitra were evacuated and the ship was grounded in the vicinity of the Prong Reef Lighthouse.